Since 1955, Fortune Magazine has released an annual list of the highest revenue generating companies in the US – the Fortune 500. In 2016, the US Fortune 500 companies generated $12 trillion in combined revenue, accounting for over two-thirds of US GDP, and employed 27 million people worldwide. In today’s dynamic economy, we know some companies and sectors are growing rapidly and others are struggling. We wanted to see which of the Fortune 500 are growing and shrinking the fastest, and which sectors. In the Craft company database, we looked up revenue for these 500 companies over 2014-16*, and calculated the average annual growth rate in that 3 year period. We found that only 62%, 309 companies, had positive revenue growth and 38%, saw their revenues decline. Healthcare was the fastest growing sector, perhaps benefiting from the regulatory environment, and Technology came in second, driven by relentless innovation in Silicon Valley. The Energy sector declined the most, matching a steep drop in the global oil price. 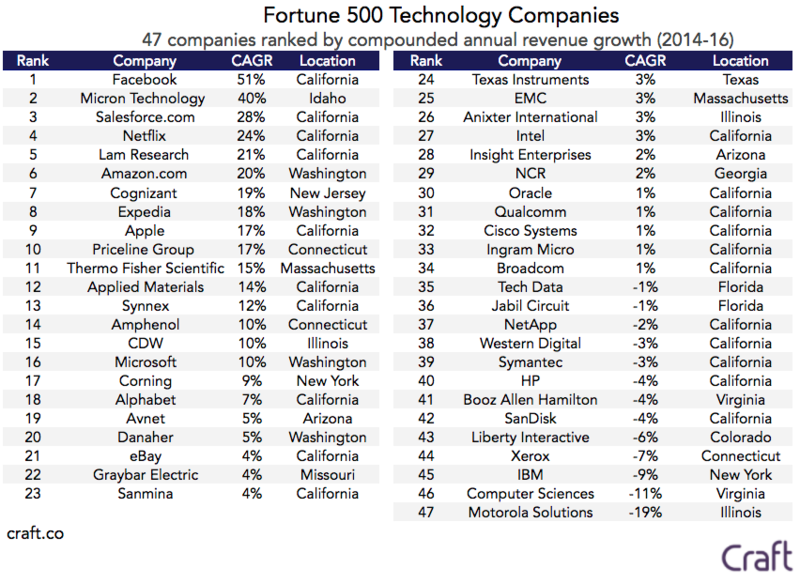 Here are the 50 fastest revenue growth companies in the US Fortune 500. XPO Logistics, providers of transport and logistic services was the fastest growing company, with a compound average growth rate (CAGR) of 230%. This growth was the result of numerous acquisitions in 2015, and 2016 was the company’s first year in the Fortune 500 list, recording $7.6 billion in revenue. NGL Energy Partners, an energy conglomerate was the second fastest growing company, with 95% CAGR. Overall, 83 companies grew revenue at an impressive 10% CAGR or higher during this period. 59 of the Fortune 500 saw their revenues decline by 10% or more. Here are the top 10 fastest shrinking revenue companies from the list. The company with the largest decline was Hess, oil and natural gas producers, whose revenue declined 58%. 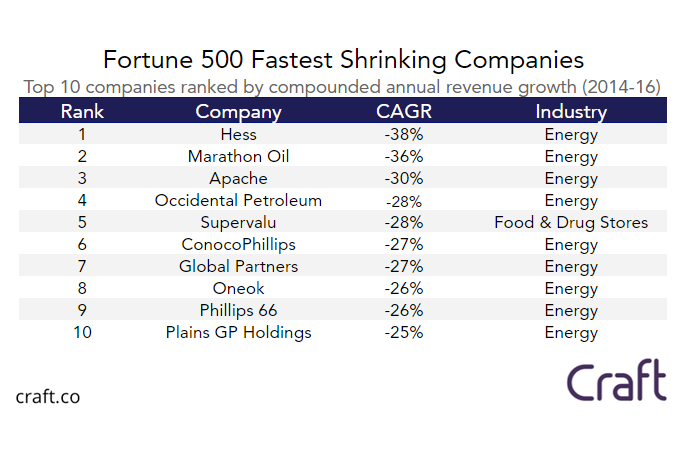 The next fastest shrinking company was Marathon Oil, which declined 38%. With the exception of SuperValu, a Minnesota-based food and drug retail chain, 9 of the 10 fastest shrinking revenue companies were in the energy sector. Looking further into the fastest growing and shrinking sectors, we calculated average revenue growth weighted by the percentage of total revenue generated by each sector. The table below ranks sectors by growth rate, weighted by total revenue. We also analyzed the list by geography to see if there were any patterns in terms of where growth was taking place across the United States. We grouped companies by State in which they have their HQ, and calculated average revenue growth weighted by the percentage of total revenue in each state. The table below ranks the states by fastest revenue growth and decline. Note we only included states with 5 or more companies headquartered there. California was the fastest growing state, with 51 of the companies headquartered there, growing at an average of 5% annually. 20 of these 51 companies are in the Technology sector, and include Facebook, Salesforce, Netflix, Apple and Alphabet. The second fastest growing state was Washington. The 12 Washington-based companies grew at an average of 2%, with the fastest company being Amazon, which grew at 20%. Unsurprisingly, given the dominance of Energy companies, Texas was the fastest declining state, with the 50 companies headquartered there, losing a weighted average of 17.5%. That was followed by New York, where 55 companies lost revenue at a weighted average of 3% annually. The number of technology companies in the Fortune 500 has steadily increased since 1955, and this sector saw the second highest revenue growth during this period. The following table shows the growth rates of the 47 companies in this sector. In this sector, 72% of companies had positive revenue growth, Social networking giant Facebook was the fastest growing company in this sector, with 51% annual revenue growth. Micron Technology, providers of semiconductors came second, with 40% revenue growth. Netflix, an online video streaming platform was a new entrant to the Fortune 500 List in 2016, had the 4th fastest revenue growth in this sector, at 24%. The fastest shrinking company in this sector was data communications and telecoms provider Motorola Solutions, declining 19%. 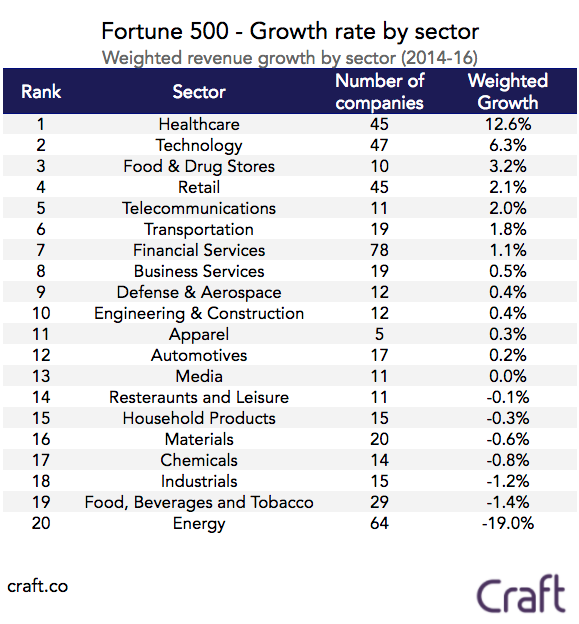 There were more companies in the US Fortune 500 with positive growth than negative, and the fastest growing companies grew at a quicker rate than rates of decline in the shrinking companies. Overall, however, the entire group actually had slightly negative growth in the period. In 2014, the combined revenues of the 500 companies were $12.069 trillion. In 2016, that figure stood at $11.995 trillion, a decline of 0.31%. It’s relatively stable at the top, however, it’s clear that at scale it becomes harder and harder to drive growth. And in the flux of the modern economy, there are plenty of companies whose biggest revenue days are behind them.